April planting of five Upland Cotton seeds. September harvest of fourty-five bolls. A boll is made up of four to five sections holding four to eight seeds. Attached to each seed surface are many many fibers each of which is an outgrowth of a single cell that develops in the surface layer of the seed. In the beginning the fiber cell elongates to its full length as a thin–walled tube. As it matures, the fiber wall is thickened by deposits of cellulose inside the tube, leaving a hollow area in the center. When the growth period ends the living material dies, and the fiber collapses and twists about its own axis. Each boll may hold up to 500,000 fibers. 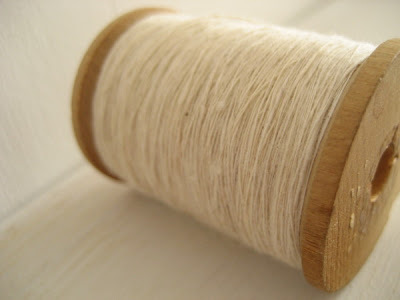 Some prepare all those fibers before spinning by removing the seeds one by one and combing the fibers to roll them into little pencil sized punnis. With my handspindle I spun directly from the soft seeded mass. The fibers tearing from the seed bit by bit. What will one boll make? The cotton still blooms and a second harvest has nearly arrived. Beautiful pictures of your wonderful treasures. mansuetude- my tiny yard may hold a few more plants in the spring, but this time not the exponential 1600 of the white cotton, I have three special seeds of rare brown cotton and two seeds of green! there's a few good tutorials and video online about spinning, but I hope to get around to documenting it sometime soon. miss liz, thank you! can't wait for our class to start either! I soooo want to try this now. I wish I could grow cotton way up here so I could start totally from scratch. Erin - your spinning skills are most impressive - very fine work! The photos are also beautiful - a warm bath for the eyes. Ritva, thank you for your constant presence. charlene, not sure where you live, but you may be able to raise a cotton plant in a large pot. Just start the seed early inside and bring the pot in as it gets too cold, cotton is self pollinating so you only need one. It is a great experiance to try. I really enjoyed this-- definitely eye candy! 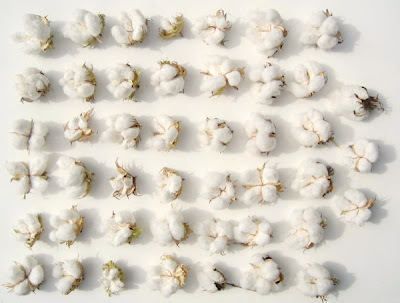 From a fellow cotton grower hobbyist! it is so amazing to me that you are doing this yourself. 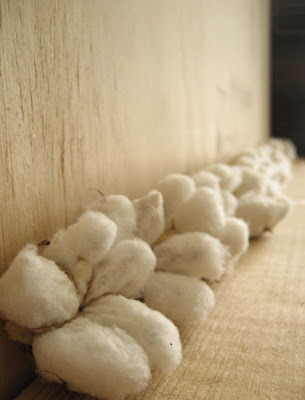 i love coming back to the image of the cotton bolls and imagining you laying each one out so nicely and carefully. also makes me think of the fruit mangosteen. it is like the best fruit in the world. 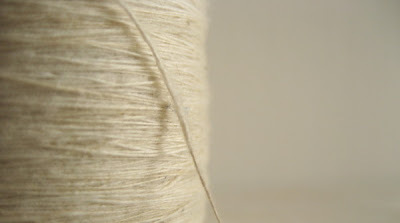 i can't believe one boll is able to make a whole spool of thread. why does thread cost so much then? oops. forgot the work put into spinning. heh. you are incredible.